My first foray into the industry was in the watch department at Christie’s, close to a decade ago, under the leadership of Tim Bourne in Hong Kong. 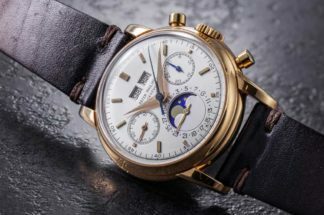 With Bonhams’ watch department slipping off the radar momentarily these last few years, it’s no surprise an industry stalwart such as Bourne, would be bestowed with the task to revive it, as new International Director of Watches, Asia. After he walked us through a few key pieces from the upcoming sale in London, I sat down with him to find out his thoughts on collecting, going digital and his vision for Bonhams. You disappeared from the auction business for a few years. Why did you return and how is it being back? I’ve been in the industry for 20-plus years and sometimes it’s good to take a breather and take stock of what’s been going on and how one’s career has evolved. It also coincided with me having three young children, so it was wonderful to have that opportunity to spend time with them during these early years. And why I’m back? Well, hey, Hong Kong feels very comfortable, I almost feel like Hong Kong is more home than England now and Vanessa, my wife, she was brought up in Hong Kong. We have a lot of friends and contacts here so it seemed the natural choice to come back. I was having a very casual coffee one day with Matthew [Girling, Bonhams CEO] and the idea came up, and we thought, “Okay, let’s give it a go” and that’s why I came back to Bonhams. It’s a new challenge and a new direction, but we have faced challenges before and we faced ways in which we wanted to grow things before, so yes, it’s exciting. Tell us about your background, what attracted you to watches and how you came to work in the auction business? I was mesmerized way back, even when I was at school, by auctions, and I remember doing projects, I think, when I was 12 years old on all the different types of auctions that used to go on and what used to hit the headlines. Now going hand in hand with that, I was actually planning on being a professional musician and it wasn’t until my early 20s that I realized perhaps being a professional musician was not my intended long-term profession. So, then I wrote to various auction houses and Christie’s in South Kensington was where I first started and that’s where I learned all of what I understood about the business. Within 10 months of working there, the possibility of joining the watch department arose, so that was a wonderful way in which I could actually start being a junior specialist or trainee specialist. That was a great grounding and England was a wonderful place to start because it was almost like an antiques roadshow on a daily basis. So, you get to see many pieces, you get to see many characters and dealers, collectors and everything else. That’s where you slowly build up your knowledge and that was obviously my first initial years in the watch business, in London, for five or six years, and gradually it moved out to Asia when Sotheby’s asked me to start the watch auctions out here. That was in 1997. It’s obvious you were brought in to revive the watch department at Bonhams. What are your plans and how are you going to develop it? Well, without revealing all my little secrets to you… [laughs] I think what Bonhams does do and where Bonhams has a niche, is that it connects with many collectors. When you can connect with collectors, that’s one of the most enjoyable aspects of the business. 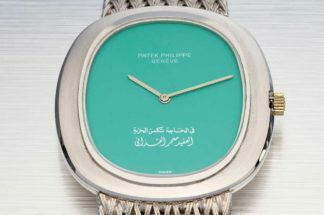 You’re discussing with them about a mutually interesting topic and you’re looking at all different types of watches from all different types of brands; collectors and everybody else represent a huge variety of cultures, backgrounds and nationalities, and also people from all different walks of life. I think watches are a collecting medium that encompass all of that and I think that’s the beauty of the actual subject matter. Everybody can understand a watch, everybody can connect with a watch on some level. Whether it’s talking about a million dollar watch or one that costs much, much less. But there are always reasons as to why someone is connected there. What Bonhams does is reach out to collectors and it has a base that is not so elitist and that is hopefully something that we want to encourage, to grow our business but with those true core values of connecting with collectors. 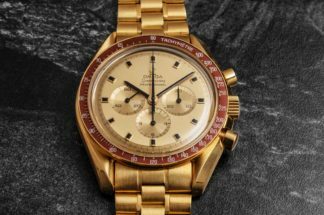 I don’t want to turn watch collectors away who perhaps have three or four, five thousand dollars to spend, because in their view that particular watch they are interested in is just as important as it is to somebody else. So, where we want to take Bonhams is obviously to, first of all, have sales back here again and to increase the size of the sales and have people interacting with us. But we want to interact with people on a 365 days of the year basis and obviously, we will look into technology and new ways in which we can relate to those collectors and how we can be relevant in their eyes every single day, because as you know, the auction business is something that is itself going through quite a lot of challenges. It’s having to upgrade itself in a very dramatic way and connect with people on a digital medium and we have to change with the times and hopefully that will transform itself over the next few months and years. With all these changes you plan to implement and build upon, where would you place the Bonhams watch department against your competitors in Hong Kong and Asia? Bonhams will establish its own identity, its own reasons as to why people come to Bonhams, why people think it’s worthwhile to sell through Bonhams. Because of the size of the company, I believe it to be nimbler, more agile. We don’t have the big corporate structures like some of the other auction houses we know so well. We can do things that are different. We have our own space here which no other auction house actually has of that size of space. We have over 8,000 square feet of gallery space that we can utilize at any time of day, week, or year. That’s an important factor, if a certain collector comes up and says, “Tim, I want to sell my watch or collection in this particular way.” We can dress up our auction room, we can divide it any way we like, we can put on the exhibition at any particular time. Our competitors have two big sales, very big showy sales, but that doesn’t necessarily work for what the collector wants. The Bonhams Watch department has been dormant until now – why? [laughs] I may not be the person to answer that correctly, and you may have to ask our CEOs, but it was dormant obviously for a reason. Bonhams has been here for 10 years and I think it’s gone through various growing pains, but I think it’s coming out the other end, realizing the exact direction it wants to go in. Matthew [Girling] has been CEO now and established himself over the last two or three years and made a plan of where he’s wanting to take the company. The two major shareholders of the company have very much supported the direction he’s wanted to take the company, so I think that re-establishing watches back into Asia was obviously a key decision, especially for what is happening in Bonhams Asia. So, watch this space, as to how this department will grow. Having worked in bigger houses previously, what is your opinion on the quality versus quantity debate in the business? There are always going to be the sure winners in any given sale, but what are some of your undervalued brands? The vintage world will always speak volumes and if something is of a wonderful, original type condition, it’s going to fetch multiples of the price that it would receive if not in such good condition. When it comes to modern pieces, again, I think you’ve got to be looking at the more creative types of brands – the people who perhaps put a little more effort into the construction of the brands, the finishing of the movement and so forth. Also, how innovative they’ve been and the number of pieces they’ve produced is important. We will see brands coming through and establishing themselves. I still think A. Lange & Söhne are an undervalued brand in some ways. F.P. Journe is a great brand that I think has got a lot of legs, obviously a lot of the more independents – Roger Smith and Philippe Dufour and so forth. They’re done in such small numbers. I also think there are some hidden independent brands that are coming through that will be interesting to follow. How much can you tell about someone based on personal collections that come through? Sometimes you can tell a lot and sometimes you can’t. It all depends on how the collections have been put together. I remember seeing a collection here in Hong Kong. There were probably about 1,200 watches in his collection, but it didn’t really mean much. There wasn’t an awful lot of passion coming from him, it was very difficult to tell what type of collector he was. There was everything from super complicated watches to super bling watches, and a very broad spectrum of brands. There was Bell & Ross mixed with a Vacheron [Constantin] Kalla. But then you also have some collectors that are very fastidious about it; building their collection in a very controlled way. For example, they’ve looked into how a brand has developed a perpetual calendar over time, they will have perpetual calendars from the ’30s, ’40s, ’50s, etc., but they also have modern day models. You can see the evolution and they’re very careful as to what type and quality of example they’ve been buying. It has to be cohesive. I think it has to mean something because you understand something about the person itself. It’s got to tell you a story. How picky or OCD they are about certain watches; that’s just getting to know the collector. You can actually sit down with them and have a conversation about their collection because they will be able to share and show reasons as to why they bought that particular watch. How are online technologies impacting the auction business? Auction houses are a very traditional type of business where they put on auctions twice a year and people come view the watches and everything else. Yes, it’s a very global participative event but it’s a very rigid structure. On a digital basis, there’s a big gap in how the feeling and atmosphere of the auction can be translated into the digital world, because at the moment, online auctions are pretty boring events. They are timed events, so people have a week or two to make up their minds. “You’ve been outbid, do you want to bid again?” Then they have time to think about. It is theoretically an auction but it lacks that excitement. Looking forward, it will be interesting to see how we can bridge that gap. Is there some way of making an online auction event exciting and can you create that highly-competitive nature online? What do you foresee are future trends for consumers and collectors? Obviously on the retail side, there’s been lots of changes, but I think that’s more the industry coping with itself because there are so many options. In terms of the industry for the collector, I think it’s in a tremendous situation. More people are understanding about vintage watches as opposed to modern, more valuing the condition or rarity of a timepiece. There is also a lot more creativity now that’s been brought into watches. Watches are a work of art in many ways, which I think is nice because it doesn’t necessarily provide this particular type of function. We’ve said several times before how it represents the personality and character of the individual. After spending decades in the watch business, what still gets you excited? Looking and hunting for collections, seeing watches that haven’t been on the auction market before. The whole business excites me, especially now, developing with everything on and in conjunction with the technical and digital side of things, how all of that translates into our business. We are going to be connecting and relating to everybody on a day-to-day basis and I think that is going to be exciting. Especially for people who have been traditionally… I was going to say “stuck,” but traditionally molded outside that spectrum. Have you noticed any changes since your break? Things have changed a lot even in the last two or three years, obviously in retail. 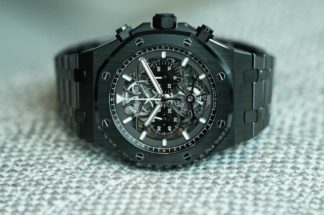 It’s interesting to see how AP [Audemars Piguet] have brought in their AP House, that whole concept. There are the e-commerce organizations and to see how they evolve will be fascinating. I very much want to be part of it. What’s the most common misconception people have about your job? They think we can afford [laughs] vast collections. That’s probably a pretty big misconception. I think we’ve always just been brokers for watches and eventually watch business people. It gets frustrating sometimes when people pigeonhole you as an auction person, because the auction business has very much changed and developed with the times. I just want to be a person within the watch business but with far more capability and breadth as to how we can relate to customers.